We are so glad to have you at this parish and excited to help you grow in your faith! From Sacramental formation to family events to adult Bible study to regular classes/meetings to pilgrimages; we are blessed with a vibrant parish that strives to grow more in love with Jesus! Join us! Bible Basics : Get a head start on Sunday Mass. Join us for a lively discussion of the weekly Scripture readings in the St. Augustine Meeting Room (at the end of the main school hallway on the right) is held during the 8:30am Parish Religious Education (PRE) session. The meetings follow the PRE calendar. All adults and teens are welcome. Coffee is provided. No registration or homework is required. Plan to attend weekly or as often as your schedule allows. Adult Bible Study : A weekly Bible Study is offered on Wednesday evenings and Thursday mornings. Registration is requested, but walk-ins are welcome. Contact the Director of Adult Faith Formation, Connie Anderson, 317-867-3213, ext. 1203, for more information. Faith and Froth: Bring your thirst for learning! All adults 21 and older are invited to attend a fun way to learn about your faith! Join others each month beginning at 7 pm. Watch the bulletin for specific topics, dates and location. 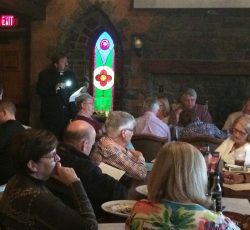 The next Faith and Froth will be May 9 at 7 pm in the St. Augustine room with Father David Huemmer speaking about The Psalms! All are invited to attend the free Parish Mission each year during Lent. All adults are invited to attend to learn about our faith. Presentations on various topics: Church History, Scripture, Sacraments, Morality, and the Blessed Mother. Check bulletin for specific topic and date. RCIA meets in the Parish Office Narthex on Monday evenings, 7-9pm. FORMED.org: ALL SMG parishioners have FREE access to this incredible resource that allows all of us to learn more about the faith that we share. FORMED.org has an extensive library of content, including videos, movies, audio, and books! You can access the content online or on the app. Click Here for your free access! Step 1: Click Here for your free access! If you have any questions, or would like additional information, just fill out the information below and we will contact you directly!